Millions of Muslims this month flock to Islam’s holiest city of Makkah (or Mecca) to perform the annual hajj pilgrimage. “Prophet Ibrahim preached the oneness of God, a message that was later revived and renewed by the last of all Prophets, Muhammad (peace be upon him),” Sayed told Al Arabiya News. Muslims call the Kaaba “the house of God” and are expected to face the direction of Makkah (or Mecca) when praying in any part of the world. Tawaf: Upon arrival to Makkah (or Mecca), Pilgrims should make Tawaf or circumambulation. 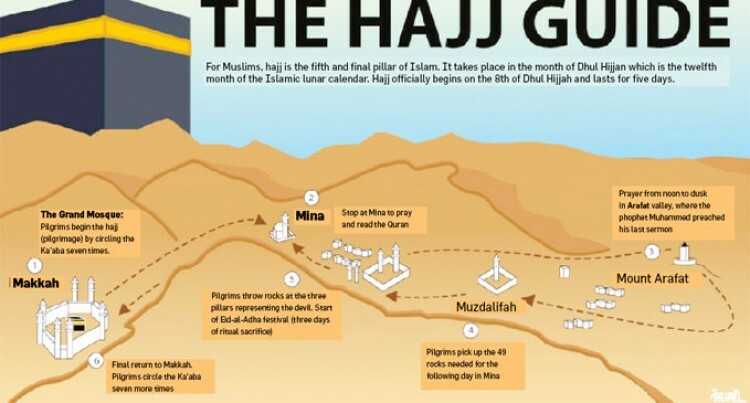 It is considered an integral part of the pilgrimage, and refers to the seven times pilgrims circle around the Kaaba at the beginning, during and at the end of hajj. The circuits are done in a counter-clockwise direction and are thought to express the unity between Muslims in worshipping one God. The rotations are marked by al-Hajar al-Aswad, or the Black Stone at the eastern corner of the Kabaa. Departure to Mina: Pilgrims proceed to the tent city of Mina on the first day of hajj or what is called the day of Tarwiah. They converge to Mina for prayer, which lies roughly eight kilometers away from Makkah. Pilgrims are required to remain in Mina until the sunrise of the second day of hajj, where they leave to Arafat. Mount Arafat: After the dawn prayers in Mina, pilgrims start their journey to the desert planes of Arafat. Dubbed as the “most important day of hajj,” Muslims spend the day of Arafat in the vicinity of the mountain, praying and repenting. The rituals of this day end at sunset, when pilgrims move to Muzdalifah. Muzdalifah: After descending from Arafat, pilgrims arrive to the open land of Muzdalifah, southeast of Mina. People gather in makeshift tents and are required to perform Maghrib and Isha prayers. It is also considered the best place to collect pebbles for Ramy al-Jamarat. Eid al-Adha: The Eid al-Adha festival, or the Feast of Sacrifice, is celebrated by Muslims who are not on pilgrimage by slaughtering animals to mark Prophet Ibrahim’s willingness to sacrifice his son Ismail upon the command of God. Pilgrims spend the three days of Eid stoning pillars that represent the devil. They later purchase tokens to have a sheep slaughtered in the Makkah neighbourhood of Mina.